Here I am getting ready to cast the CTD. While the weather holds, we head out on the launches to survey areas that are not charted or were last charted probably back in the time of Captain Cook. After the boats are lowered using gravity davits, 4 boats head out to survey. Upon reaching the survey area, the first thing that gets done is a casting. This consists of lowering the CTD (Conductivity, Temperature and Depth) unit into the water at the surface for 2 minutes for calibration. Then it’s lowered to the sea floor (taking measurements as it goes) and brought back up to the surface with a winch and a pulley system. The sensor unit is cabled to the computer and the data is downloaded. 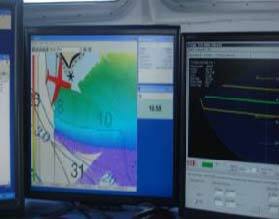 This is a vital step in interpreting the sonar data. Since saltwater conducts electricity differently based on the salt concentration, using the CTD gives the hydrographer information about sound velocity at different depths. Velocity of sound is most affected by temperature, which is also measure by the CTD. Next, the hydrographer decides whether to use the high or low frequency transmitter depending on the depth. The hydrographer uses a lower frequency for deeper water. Casting is often done again after lunch since temperatures can change, especially at the surface. 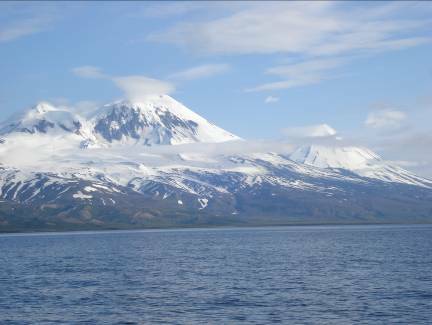 Alaska is known for the confluence of fresh and salt water at the surface due to melting glaciers and fresh water runoff. The MVP (moving vessel profile), is another device used for sound velocity. It looks like a torpedo and it’s towed behind the boat allowing for continuous casting. The shape of a plane has more points than a boat so is a good way to use points to line up a survey transect. The plane you see on the picture is used instead of a boat because of the position of the GPS sensor relative to the shape. The coxswain can make the plane pivot on a point as they line up on a line to survey. On the survey, the map is broken down into polygons. Each sheet manager gets a sheet with their polygons to survey. Surveying consists of the coxswain driving the boat as they watch the computer screen. As they drive, the screen shows in real-time a swath of color indicating the swath of the beams. After surveying, the boats return to the ship and are hoisted back up onto the davits. All survey techs meet in the wardroom to discuss what happened on their survey. The Captain and FOO (Field Operation Officer) ask questions about what was surveyed and any problems they had with any equipment. This is a true community of scientists who share data and knowledge. We load the launches at 8:00 am and complete surveys until noon. We break for lunch and unpack the ice chest packed by the cooks for us. It’s always a surprise to see what we have! Then we continue surveying until about 4:00 pm when we return back to the ship. I have had the opportunity to cast the CTD unit into the water, drive the launch and collect the data on the computers. The coxswains make driving the boat following the lines on the computer look so easy! Especially in rough seas, the coxswains do an amazing job of helping the survey techs collect data. Again, good communication is a key! I’ve also seen how the techs have to problem- solve on a daily basis. One day we got into the launch and the engine wouldn’t start and the coxswain had to troubleshoot the problem. Another day, several boats had problems with their CTD units and they had to repeat trials several times. When you are 12 miles away from the nearest help, it’s crucial to have good problem-solving skills. After dinner, there’s time to finish writing journals, do laundry, fish off the fantail, watch a movie, play guitar hero or exercise in the gym area. Then, it’s time for bed and the day will start over again. If you are not on a survey launch, you work in the night processing lab compiling the data collected by the survey techs during the day’s launch. This includes applying various filters to clean up the “noise” or fuzziness from the sonar. The coolest part is seeing the data in three dimensions. 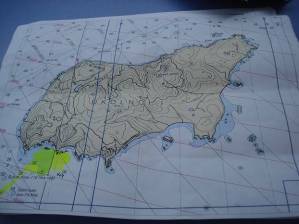 After the data is cleaned up, the sheet managers write up a descriptive report that gets sent to Pacific Hydrographic Branch. This ship is a great example of a system: there are many separate parts that when combined with other parts, complete a task. Pavolf and Pavlof’s Sister are active volcanoes. Each night at 10 pm, fellow Teacher at Sea –Jill Stephens and I go to the bridge and collect weather data that is transmitted directly to NOAA. Although the days have started off hazy and grey, by evening we often see sunshine that lasts until 11:00 pm. This part of Alaska is breathtaking! I love watching the volcanoes, Pavlov and Pavlov’s sister, in different types of light. Whales, Puffins, and Sea gulls. Cavitation: The sudden formation and collapse of low-pressure bubbles in liquids by means of mechanical forces, such as those resulting from rotation of a marine propeller. 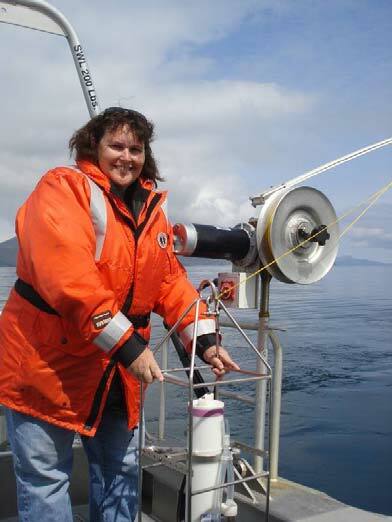 This entry was posted in 2009, Mary Patterson, NOAA Teacher at Sea and tagged Alaska, cavitation, ctd cast, data processing, GPS, Hydrographic survey, multibeam sonar, noaa ship rainier, seabirds, volcano, whales. Bookmark the permalink.